It’s been a minute since we heard last from Montreal’s CLARIAN on KOMPAKT (KOM 356 – ANKH EP ) but by no means has his universe stopped expanding as he released the 2017 full length SYNTH WAVE (BALANCED) and collaborated with TIGA on STAY CLOSE and THEY JUST WANT 2 B U (w/ JAMIE PRINCIPE and FELIX DA HOUSECAT) singles. We welcome back CLARIAN with TIME SAFARI. The majority of the EP was a 2 year long process from recordings made in South Africa as a team effort ofRICHARD MARSHALL, BLANE VENTER and of course CLARIAN (along with many locals along the way) with the “ambient aspect” of the EP finished in India in summer 2018. By no means is this EP to be perceived as experimental recordings as each club track has a theme that is loyal to the dance floor with a goal of incorporated ambient recordings to create an immersive environment. 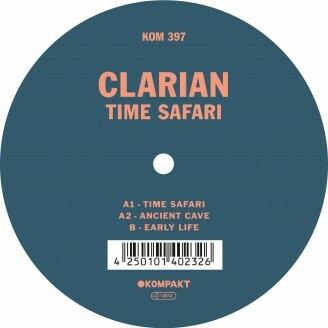 The aim CLARIAN has with TIME SAFARI is to attempt to empower the idea that club music can go beyond simply being labeled as a genre and club motif but can also explore alternative, creative and most of all be a conduit to bring unity through all variations of art mediums into the night life scene. The ambient aspect of TIME SAFARI is CLARIAN’s homage to his heroes. Think if TUXEDOMOON collaborated with CARL SAGAN to create a weirdo version of COSMOS. In the case of this EP – a mega brief journey of human evolution through South Africa. Es ist eine Minute her, seit wir das letzte Mal von Montreals CLARIAN auf KOMPAKT (KOM 356 - ANKH EP) gehört haben, aber sein musikalisches Universum hat in der Zwischenzeit nicht aufgehört, sich zu erweitern. Er veröffentlichte 2017 SYNTH WAVE (BALANCED), arbeitet zusammen mit TIGA auf STAY COOL und auf der Single THEY JUST WANT 2 B U mit JAMIE PRINCIPE und FELIX DA HOUSECAT. Nun begrüßen wir CLARIAN mit TIME SAFARI zurück. Der Großteil der EP, alles in allem ein zweijähriger Prozess, sind Aufnahmen gemacht in Südafrika zusammen mit RICHARD MARSHALL, BLANE VENTER (und vielen Locals von unterwegs); der „ambient aspekt“ wurde im Sommer 2018 in Indien fertig gestellt. Diese EP ist keineswegs als ein experimentelles Projekt zu verstehen, da jeder Track ein Thema hat (nämlich das der Tanzfläche treu zu sein) und nur das Ziel verfolgt, durch integrierte Ambient-Effekte eine immersive Erfahrung zu schaffen. Die Idee, die CLARIAN mit TIME SAFARI umsetzt, ist: Clubmusik nicht nur als Genre und Stilrichtung aufzufassen, sondern auch als alternative und kreative Art und Weise Kunst ins Nachtleben zu bringen. Ambient ist auf TIME SAFARI vor allem aber auch eines: eine Hommage an die Helden CLARIANs. Stell dir vor, TUXEDOMOON hätten mit CARL SAGAN zusammengearbeitet, um eine Version von COSMOS zu produzieren. Ach, diese EP macht sich einfach von Südafrika aus auf die Reise in die Zukunft.